There are so many trucks and tractors in Apple Harbor! 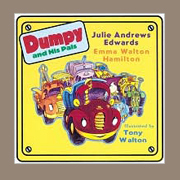 Now children can meet them all in a chunky board book that introduces preschoolers to Dumpy’s pals and their special sayings. There’s Bee-Bee the Backhoe, who believes that “two hands are better than one!” and Stinky the Garbage Truck who knows “It’s not what you do, it’s how you do it!” along with many more. This younger format is perfect for little ones who can’t wait to get to know big trucks!